A former Governor of Rivers State and Minister of Transportation, Chibuike Amaechi, has told his supporters to mobilise and register more voters for the All Progressives Congress ( APC) to ensure victory for the party in the 2019 general elections. Amaechi spoke, on Saturday, during a ward-to-ward sensitisation visit christened ‘Operation show your PVC’, to communities in Ikwerre Local Government Area of the state, on Saturday. 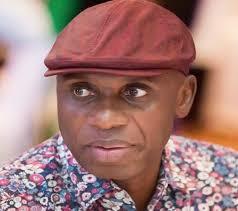 Amaechi said the only way to benefit from government was to elect good leaders. Said he, “You people need to work hard because, if we don’t win you, will not get any benefit. The day we win, is the day we should expect change in Rivers State. “When we win, we will focus more on bettering the lots of our people because I believe that things should change. “The only way to effect that change is to go to your various units and wards and commence new registration of members and I expect the new members to have their voters’ cards, that is the tool you will use to remove bad leaders”, he said. Also speaking, Mr.Ezemonye Ezekiel-Amadi, a candidate for Ikwerre /Emohua Federal Constituency, said the programme has shown that the people were ready to vote for change in the State and at all levels. According to Ezekiel-Amadi, “This exercise goes to show that our people are ready to make a change in 2019. “It shows that we are ready to mobilise our people for victory, but that doesn’t mean we should go to sleep. We also need to work harder. “With what we are seeing today, I can assure you that we will win the elections any time, any day. “Let me also urge our supporters to remain committed and focused in this course. That is the best they can do to enthrone good governance at all levels”, he said.